So, I just posted earlier today that the Google social network Google+ is currently ranked 2nd in active daily users, and is rapidly getting ready to go toe-to-toe with the big blue. In more 'numbers' news, we see the smartphone shipment numbers for the last quarter of 2012 appear. These are pretty good, and they include the "Black Friday", "Cyber Monday", Christmas and Boxing Day sales. Strategy Analytics released their research showcasing the facts. 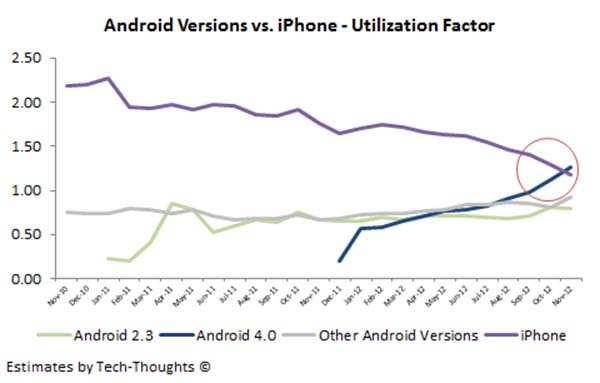 Maybe the 51% we had heard about was just devices, not just smartphones. But still... 70%, overall for the year it's 68.4% (meaning more people bought it as a nice present over the holidays than an iOS counterpart). Compare it to last year's 51.3%, that's a 40% gain year over year. Huge increases from a wee little droid. 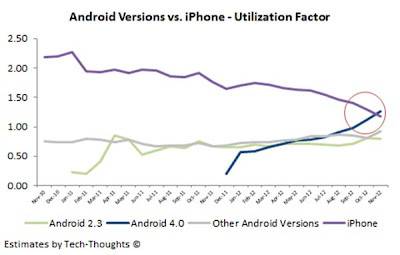 Plus we hear that "Tech Thoughts" has seen the usage of ICS beat the usage of iOS for web-browser use. Now, is this growth sustainable? I think it is, I think we've not yet begun to see what this little piece of software can do when coupled with great hardware and innovative OEMs.